Dr. Hubertus Hoffmann interviewed the commander of the NATO - ISAF forces in Afghanistan, U.S. General David Petraeus, about progress in Afghanistan in the last eight months. Recently, the Afghan Government announced that it will soon start assuming security responsibility for 7 regions throughout Afghanistan. President Karzai explained on Tuesday, March 22nd, that the transition will commence in July with the provinces Bamyan, Panjshir and most of Kabul Province as well as the provincial capitals of Mazar-e-Sharif, Lashkar Gah, Herat, and Mehtar Lam. It marks the first step of the transition process where the Afghan National Army and Afghan National Police take over security resposibility from NATO forces, as the International Community and the Afghan Government have pledged at the London and Kabul Conferences in 2010. 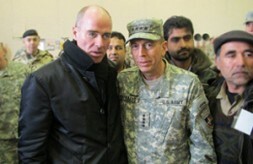 The legendary American hero from Iraq and now commander of the NATO - ISAF forces in Afghanistan, U.S. General David Petraeus, gave the World Security Network Foundation an exclusive interview in Mazar-e-Sharif in North Afghanistan about progress in Afghanistan in the last eight months.